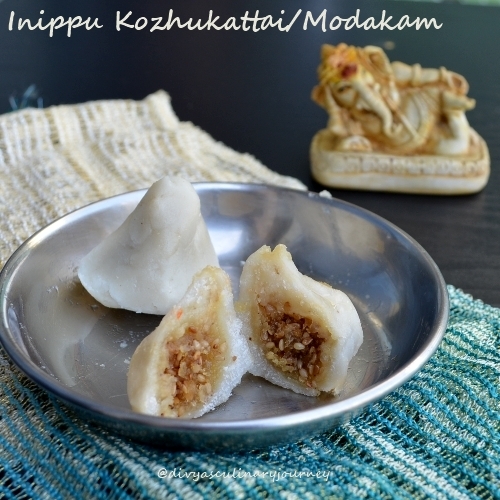 Today's recipe is Inippu ellu Kozhukattai that is coconut, jaggery and sesame seeds stuffed kozhukattai. Every year for Vinayagar Chathurthi, Mom used to make this kozhukattai. It is my favorite and now Thaara also loves this. 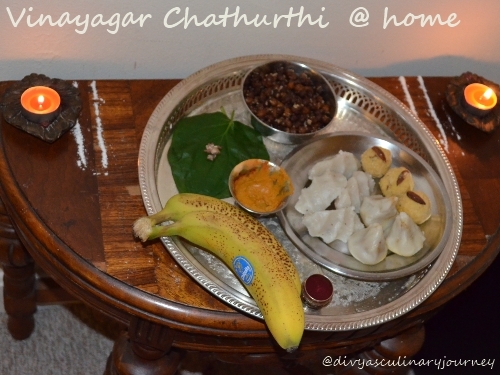 For this Vinayagar Chathurthi, I made plain kozhukattai, this sweet kozhukattai, Kondai kadalai sundal and Besan Ladoo. Remove the skin of the cardamom and powder its seeds with a tablespoon of Sugar. Mix the sesame seeds, grated jaggery, grated coconut and powdered cardamom. Mix them well till they are fully incorporated. Take a lemon sized ball of dough and make it into a shape of a cup. Then stuff the cup with the prepared stuffing. Close it and seal it. Offer to God and Enjoy! There are other methods of preparing the dough for the kozhukattai. This method for me is simple and it works just fine. 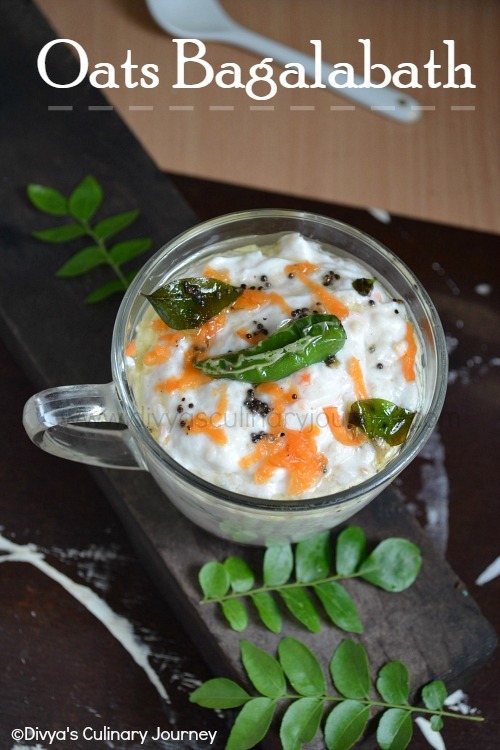 I would love to try this yummy modakam soon. They looks damn cute and highly addictive..Loving it. Love this filling,my fav too..looks very tempting!! Loved the thali so much..Perfect Divya ! Looks yummy & traditional modakam. yummy kozhukattai with one of my fav filling...nice clicks! like your cute ganesha idol :) and his fav kozhukattai too..
was recently in Mumbai and got a chance to try these modaks..these look absolutely wonderful. So well done!..love these anytime..